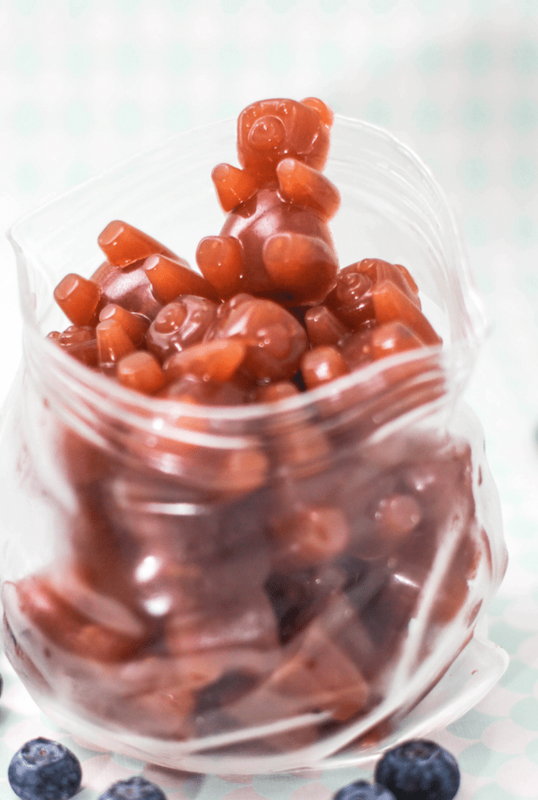 Healthy Homemade Blueberry Fruit Snacks — perfect for when you’re craving something fruity and sweet and soft and chewy, yet healthy and all-natural! 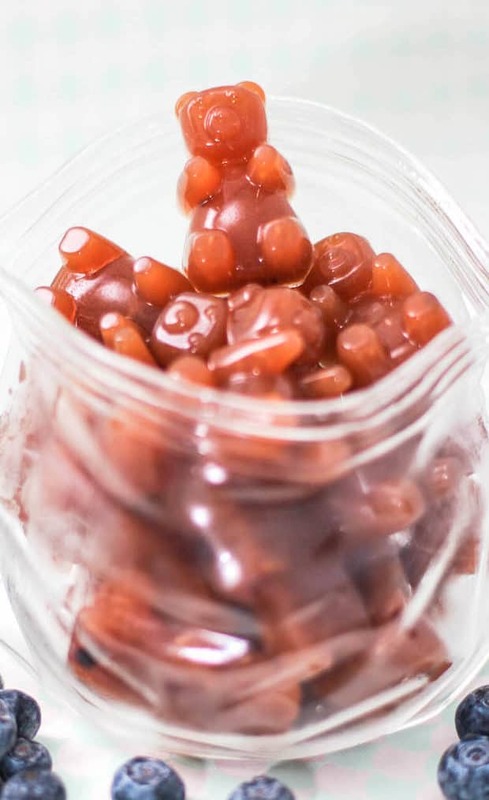 These DIY Fruit Snacks are just like storebought fruit snacks, except these are made without the high-fructose corn syrup, artificial food flavorings and artificial food dyes. 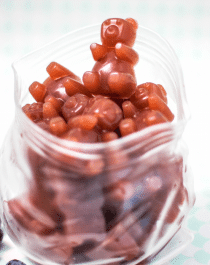 I based this recipe off my Strawberry Fruit Snacks recipe but swapped some of the flavors. In my first batch, I pureed blueberries instead of strawberries and reduced the amount of lemon juice. The color was a very dark blue, almost black, and the flavor wasn’t that great. Even though I rinsed the blueberries and picked through them to remove the stems, I guess I missed some because I bit into a couple in my gummies… oops! In my second batch, I used my KitchenAid® Juicer to make a juice instead of a puree (you know, to avoid that stem issue). I used a mixture of blueberries and grapes, and added blueberry flavor to make up for the missing blueberries. I was hoping these changes would make the gummies taste better than the last batch. They did! However, the color wasn’t anything like the first batch. The juicer removed the blueberry skins which is where all the blue color comes from… the inside of blueberries are green, so along with the green grapes, the juice was just green. I added some natural food colorings to help add some color and it worked just fine. These homemade Blueberry Fruit Snacks are perfect for when you're craving something fruity and sweet and soft and chewy, yet healthy and all-natural! Rinse the grapes and blueberries and drain the excess water. Attach the KitchenAid Juicer Attachment to your stand mixer with the high pulp filter, then place a tall container underneath the juice opening and another container underneath what I call the "poop shoot." Turn the stand mixer on high speed and start juicing! Juice the grapes and blueberries until you get ~1¼ cups grape juice and ~⅔ cup of blueberry juice. In a nonstick saucepan, stir together the grape/blueberry juice, lemon juice, blueberry flavor, stevia extract and food colorings with a rubber spatula. Sprinkle the gelatin on top, stir lightly, then let it sit for 5 minutes. Place the pan over medium-high heat and smush the big clumps of gelatin, but you don't need to worry, they'll dissolve. Stir constantly until the mixture begins to bubble. When you can't stir the bubbles away, then remove from the heat. 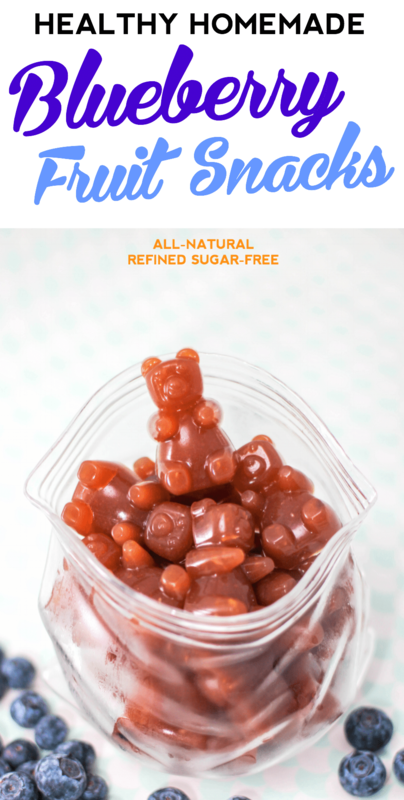 Place your gummy bear molds on a cookie sheet, and then fill the molds with the gummy bear mixture. Let cool on the counter for about an hour, then place the tray in the fridge. Refrigerate overnight. Refrigerate to store. Keeps for ~4 days. These Healthy Homemade Blueberry Fruit Snacks are perfect for when you’re craving something sweet, but want to snack on something healthy! Is there a lower sugar fruit that could be used in place of the grapes? Like, raspberries or strawberries? Is there a way to make this without gelatin?